In case you haven’t heard (or guessed by my clever title)…I’m moving! Yes, the day has finally come. I found an apartment a few weeks ago with my friend from work, Missy, whom I’m sure will be featured in many future blog posts, and we’re moving this weekend. Are we packed and all set to go? Um…sure! It has been pretty hectic around my house, and I’ve had a ton on my plate – both literally and figuratively, since I am a hungry ginger, after all. One of them (the figurative one) was to check out Make It Your Own by cookbook author Jamie Miller. The connection is a long story, and all you really need to know is blah, blah, blah she sent me her cookbook to try out her recipes. The book looked great, so I agreed to do it. Her book basically focuses on using different sauces for a variety of dishes to make each one your own…hence, the title. If you always find yourself making the same chicken recipe, for example, and are looking to spice things up, this book is for you. The only problem is that you need some unique ingredients for most of these recipes – ones that I don’t usually have in my pantry. I wanted to make the gruyere stuffed salmon burgers with maple-mustard glaze. Maybe next time after I go grocery shopping. I settled on the Provençal grilled lamb chops minus the recommended aioli. I don’t even eat lamb! It was a tight pantry. The recipe was super easy – and according to my dad, it was flavorful and perfectly seasoned. This is what happens when you take pictures on your camera phone. Because I’m a last-minute kind of gal, I spread this paste on the lamb chop and let it sit for 10 minutes instead of the recommended 2-4 hours. I think we made it out okay. 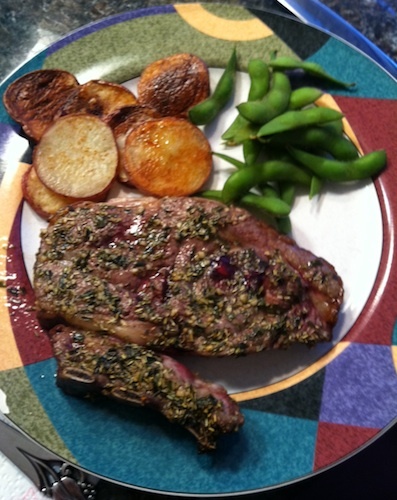 The lamb chop wasn’t such a great quality, as you can see, but this was an easy recipe in a book for a serious cook. I had to scrape together something else for this meal, and I had the perfect go to recipe that calls for just 5 ingredients. It is a crowd favorite, and I would really recommend making it because it’s extremely easy – and impressive, if I do say so myself. Spray four ramekins** with Pam. 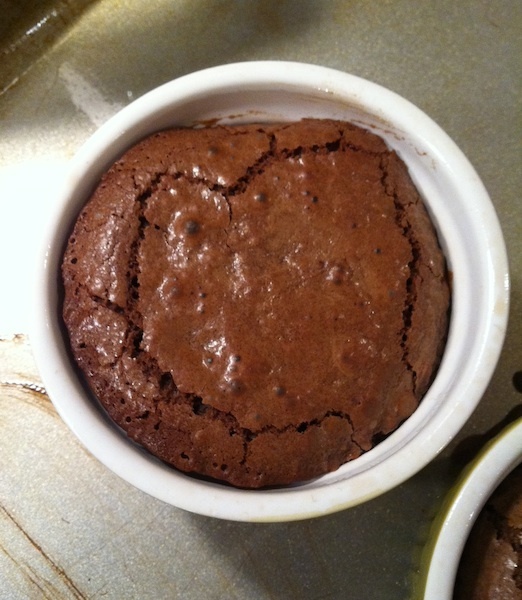 Preheat your oven to 450 degrees F.
Melt chocolate and butter together. I’d recommend a double boiler, so you don’t burn the chocolate. To create a makeshift one, just boil a pot of water and place a glass bowl with the chocolate and butter over the top, stirring carefully as they melt. Unless your butter is frozen, put the chocolate in first because it will take longer. In a separate bowl, whisk yolks and eggs together. Mix in powdered sugar and then flour. Let the melted butter and chocolate cool for a few minutes. Very slowly incorporate it into the egg mixture. I say slowly because if you aren’t slow enough you can boil your eggs. True story. Fill your ramekins 3/4 of the way full. Bake for about 6 minutes. If you add on time because of your oven, just add a minute or two because these are very delicate cakes. 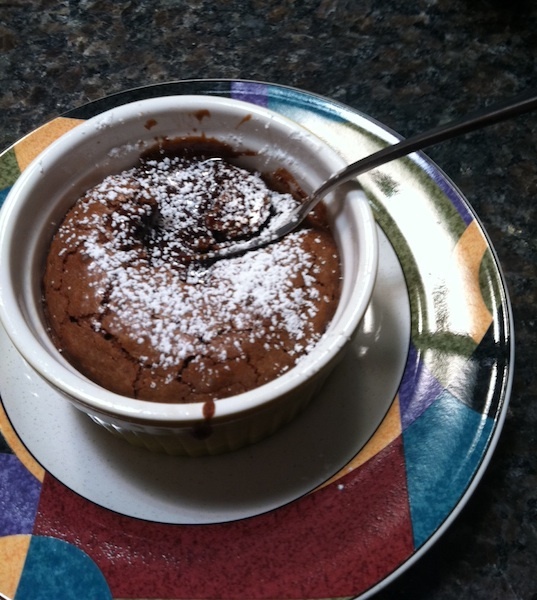 **Note: If you don’t have ramekins, you can use large muffin tins. Just be sure to watch them very carefully. You can pop them out after letting them cool for a bit. Amazing. And yes, it tastes as good as it looks. Eat as directed: straight out of the oven, with a spoon for the molten center, preferably with ice cream if you have some (not all of us are so lucky). Think I’m bringing those ramekins to my new apartment on Saturday? You’d better believe it.